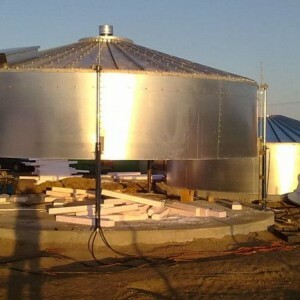 Membrane type of tanks constitute an economical solution within the scope of management and storage of drinkable water, fire water as well as for agricultural needs. Application of pre-fabricated elements assembled on site such as galvanised steel panels, roof structures put together from galvanised elements as well as additional internal sealing systems manufactured from individually chosen membranes constitutes the reason why Globtank is considered to be the long lasting and maintenance free solution. 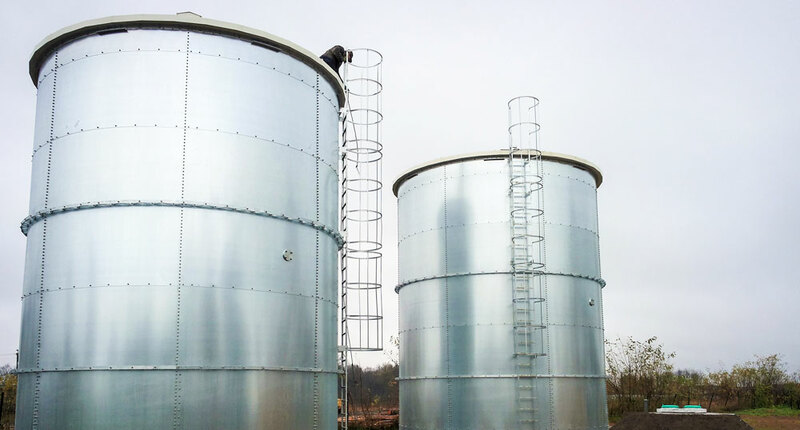 Standard tanks are available in sizes ranging from 10 m³ to 2 0000m³, and come available within the following listed range of diameters 3,00 m up to 22,00 m and heights from 1,25 m up to 13,26 m. All non-standard as well as larger sizes of tanks are available upon individualised orders. The fire water reservoir offered by Globtank may be equipped with certificates issued by the UK Loss Prevention Certification Board as well as by the American Factory Mutual Assurance (FM) within the scope of fire water storage. The membrane tanks of the company of Globtank also posses adequate certificates of the Polish Hygiene Authorities (PZH certificate) within the scope of drinkable water storage and management. Fast and problem less assembly The steel casing of the tank is not subject to any additional sealing or tightening which means that the process of assembly executed from the level of foundation slab with the application of hydraulic jacks does not impose any threat from the point of view tightness of the reservoir which consists of a large number of connecting sections between various steel panels. Simple foundations All that is required for the correct placement of a reservoir is a flat and most frequently concrete slab which is capable of bearing adequate load. The starting angle section which is located at the bottom of the tank is simply fixed to the slab. No maintenance required Galvanised steel panels applied in the process of the assembly of tanks are manufactured with the application of high quality initially galvanised belts, of the galvanisation class amounting to S350GD featuring double sided 300 g/m galvanisation coat. Adoption of such approach guarantees the very high degree of anti-corrosion protection of the internal surfaces of tanks and silos. From the insides all tanks and silos are subjected to pre-fabricated individualised sealing performed with the application of hot applied membrane which guarantees separation of the reservoir shell from water the fact that practically rules out the frequently met issue of corrosion so common for other types of similar solutions. Moreover, the membrane also guarantees much longer lifecycle in comparison to other sealing materials which are applied directly upon internal surfaces of walls, including epoxy paint coats applied directly upon the construction site so frequently encountered in the case of welded tanks and silos.